We have simplified the wedding floral process allowing you to have high quality flowers for unbeatable prices. All shopping cart images are designed with white flowers. But you still have the ability to customize to your color palette! We can even deliver! Or you can pick up from our workshop! Select your preference and add it to your shopping cart. We understand that planning an event or wedding can take up precious time and cost a lot of money! So we have created a system that allows our clients to order beautiful florals that look (and even are) custom made! 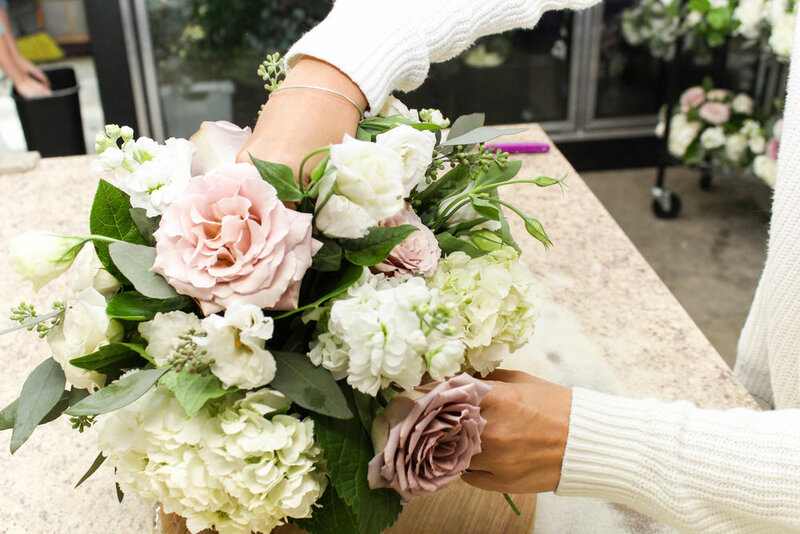 By making the process easier for both parties, we can offer floral arrangements that are much cheaper in price. If you are looking for more tailored designs or floral installations, then please email us blackcreekflowers@gmail.com. The process is simple! Take a look at our Al La Carte options of flower arrangements. With a click of a button you can add them to your cart. Be sure to add your delivery/pickup preference as well. Also, make sure that your total reaches our minimum of $250. Once you have all that you need, you can check out. During the checkout process you will be asked for a delivery location and date. Once completed, you will receive an automated confirmation email, and we will reach out to you for a phone call to confirm all those final details. Your entire order will then be delivered to the specified location on the specified date. Easy! Please add the option of Delivery (to the Metro-Richmond area) or Pickup (to pickup at our workshop in Mechanicsville) to your shopping cart. During the checkout process you will be prompted for date and location information. Delivery around the Metro Richmond area, based on a 25 mile radius is $75. (Email us at blackcreekflowers@gmail.com for information on delivery outside of this radius.) If you chose Delivery, we will deliver to one location only. Also, we do not provide setup. Instead, we'll leave your flowers at the specified location and we will provide instructions to keep your flowers healthy and beautiful. Please assign someone to accept and sign for your flower order. Pickup at our workshop is $25. If you choose this option, we will provide directions ahead of time, and on the event date we will help load your vehicle. To provide flowers at great, low prices, we have a minimum of $250 total for each order. All pictures on our site are made with mainly white flowers and greenery. You have the option to choose accent colors, and make small requests for personalization. Please place your request in the comment section, after adding each item to the cart. Some Examples are: "Please include Pale Pink" or "I love Red Roses" or "Please include more Greenery". We will try our best to accommodate these requests. And we will communicate with you about the requests during our phone call and over email. Not all requests can be fulfilled, but we're pretty good at finding the right flowers and colors for our customers. All orders must be placed 30 days in advance of event date. Cancellations must be received no less than 30 days prior to event date. No refunds are available within 30 days of the event. Refunds issued prior to 30 days will be subject to a $50 administrative fee. Additions must be made no later than 7 days before the event. Client must include time window of drop off and exact location of drop-off only service. Client must arrange for someone to accept flowers and sign for them. Black Creek Flowers is not responsible for unpacking or setting up any items. Client understands and agrees that flowers are products of nature, and floral design services are often a subjective art. Black Creek Flowers has a unique vision and has the final say regarding flower selections. Client understands that the dissatisfaction with our aesthetic judgment or artistic ability are not valid reasons for refunds.